"This unlicensed, makeshift establishment in Abby’s backyard is the perfect gathering place for locals to find camaraderie and sanctuary. To maintain the perfect bar ecosystem, all patrons must abide by a specific set of rules. This includes no cell phones (not even to look something up), understanding that earning a seat at the bar takes time to rise through the hierarchy and knowing that losing a challenge may have some unpleasant and unpalatable drink-related repercussions. As bar owner, Abby (Natalie Morales, “Parks and Recreation,” “The Grinder,” “Trophy Wife”) has found her true calling, hosting friends and newcomers alike. No nonsense, Abby is ex-military, having served two tours as a Staff Sergeant in the Marines. Her world is shaken when new landlord Bill (Nelson Franklin, “Black-ish,” “Veep,” “New Girl”), who recently inherited the house from his deceased aunt, unexpectedly shows up citing all kinds of reasons why the whole venture is illegal. Newly divorced, he is a cautious worrier and definite non-risk-taker who eventually warms to the place and agrees to let the bar remain open, provided Abby makes some changes. ". To tell you the truth that probably says pretty much all you need to know about the show, except perhaps: does it work? I had totally forgotten this was ordered by NBC along with I Feel Bad, which was atrocious. Thankfully, this is not the same. 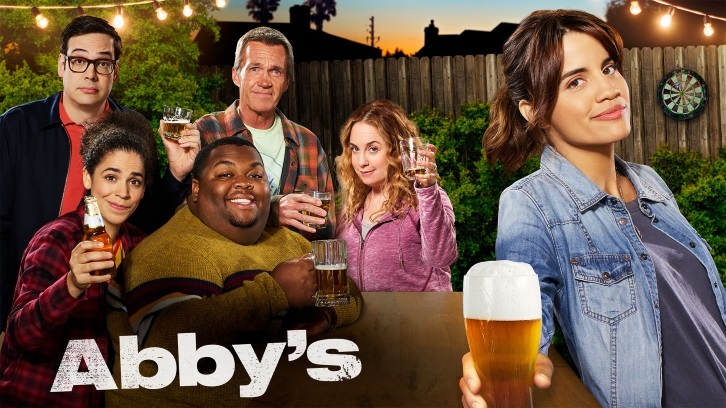 Abby's is a sitcom, which is not something I love, but it's charming, entertaining and overall full of heart. I'll admit it gets a little cheesy too soon, but it does make sense if they want people to know soon where it's headed. Abby (Natalie Morales) is super cool, fun, and bi (which is addressed later on), and Bill is adorable, as Nelson Franklin usually is. The other clients are a little too bland at times for my taste, but the premise does allow for new faces to pop up as often as it's needed. Still, the cast is pretty good, including Neil Flynn (The Middle), and Jessica Chaffin (Man With a Plan). Abby's is a place that gives these characters a relief from their everyday lives (maybe a little too much since it seems some spend all day there) and it's somewhere they can find a family, a place of support, even if that doesn't exactly fit Abby's strict rules and condescendence towards her clients. In that respect, it makes me think they had two different ideas about how the bar could be and they just mixed them together without it really making much sense. Still, that doesn't make it any less enjoyable or fun, this will not be a groundbreaking show, but we rarely expect that from comedies, if what you're looking for is something to watch when you want a little light fun and characters to eventually fall in love with, this might be perfect for that. Especially since the first season is only ten episodes long. Abby's premieres Thursday, March 28 at 9:30 p.m.